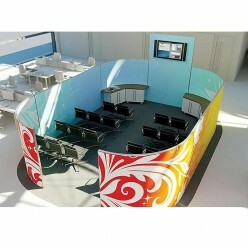 Specialised screens with bespoke art, reflecting your business. This set of bespoke screens in a rounded rectangle shape provides an exceptional feel while providing a space for presentations. Maximise space and promote your business with bespoke artwork. Rounded Rectangle providing a sizable presentation space. Will depend on your requirements.